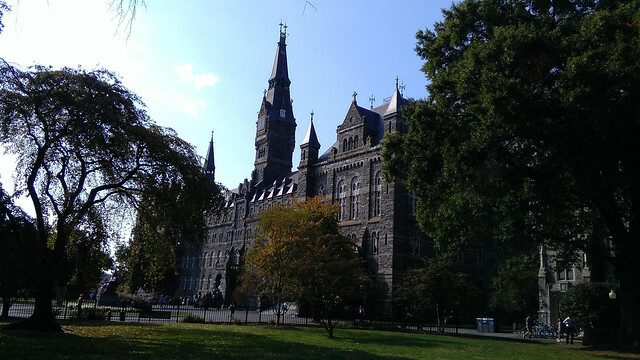 I chose Georgetown University as my destination because of my research interests. I am in the close-to-final stage of my PhD dissertation, and wanted to work in a place that seemed to fit my research needs and plans the best. Not only were my expectations were met in Georgetown, but also exceed, making my experience here richer than I could have expected. Tucked away from the bustling core of downtown Washington DC, the historic University of Georgetown stands high up on a hill, surrounded by colourful houses that remind the (European) visitor of an old British town, rather than of the capital of the United States of America. In fairness, Georgetown was established some 50 years before George Washington sold part of his Virginian land properties to the nascent US government as a convenient site to build the future capital on. It retains a very “own” character to this day. 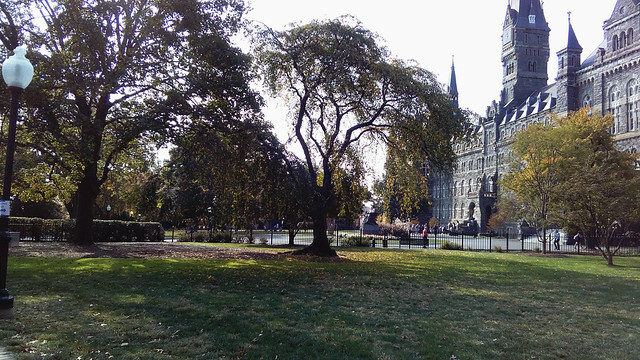 I felt very welcome to Georgetown University, from the very first days. I am affiliated with the BMW Centre for German and European Studies at the School of Foreign Service. Moreover, I have attended courses and seminars in other Schools and departments, thus meeting other graduate students and academics with expertise in my field. In just a little over two months in a foreign University, I came to feel part of the university community pretty seamlessly. This is doing a lot of good to my research and a lot of good to me as an individual. Then, there is DC. For those who research policy and the rationale for policy in any sector, Washington DC is like a huge aquarium where all kinds of fish, big and small, dive past past each other, looking for food. The food in their case is information, and knowledge. Washington DC is “the” hub for those who have an interest in (making, studying, influencing, understanding, criticising, improving) policy: consultants, lobbyists, interest groups, associations of all sides, journalists, public relations people, opinion-makers, and of course, academics. But DC is not only that. It is a vibrant, diverse city where each neighbourhood has its own personality and close-knit communities. It is a very green, hilly and cyclable city that offers lots of free cultural entertainment (although everything else is pretty expensive). It is also, sadly, a very unequal city, with highly problematic areas where crime rates are high. This very pronounced divide is somehow startling. The plethora of community initiatives put up by common citizens to narrow the gap between the overly rich and the overly poor is, however, equally astonishing and shows what, in my opinion, is the best part of the American mindset: that one should not assume things will always be the same; that people have agency, and should make use of it. I feel very lucky to be here. 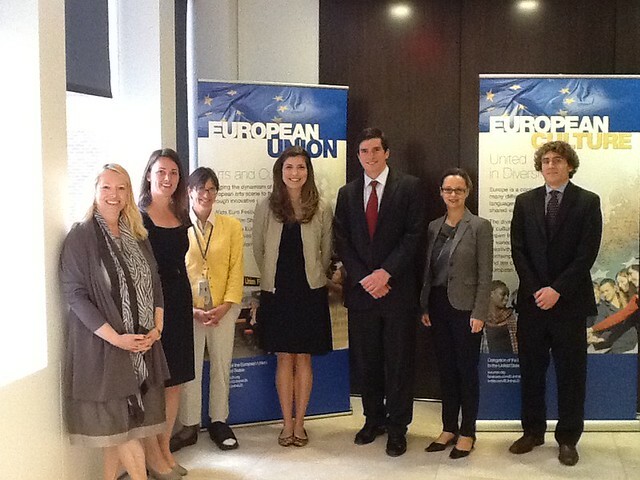 And I feel very lucky to be European, and to have benefited from the Fulbright-Schuman grant. Without it, this incredibly important experience would simply not have happened.